As a child I thought everyone ate the same thing for all the major holidays. You know, turkey on Thanksgiving, ham on Christmas and for Easter, hot dogs and hamburgers for Independence Day. It wasn’t until I was a little but older that I learned that people eat all sorts of things based on where they grew up, their family heritage and different traditions. This has fascinated me and is one of the reasons I started this blog, to share some of MY family’s recipes. Sure, many of us share some of the same food traditions for most holidays, like Christmas and Independence Day (turkey and burgers from sea to shining sea), I have learned over the years, and am continue to learn, that Christmas is a very unique, and personal holiday in regards to traditions and food. For my family, growing up we had a big home cooked breakfast Christmas morning, snacked on appetizer and finger foods throughout the day; and either had a smoked turkey or glazed ham with all the fixings on the side (basically our favorite side dishes that didn’t make it to the Thanksgiving table and a few repeats) for our big meal on Christmas Day. My in-laws on the other hand, are Italian, so they have always had a classic Italian “Feast of the Seven Fishes” fish dinner for Christmas Eve and nothing really traditional (sometimes more fish, sometimes a pork loin, or sometimes prime rib) on Christmas Day. Then being here in Texas, many people enjoy a smoked brisket or tamales for Christmas. And who can forget that infamous scene in “A Christmas Story” when Christmas dinner is ruined and they go eat at the local Chinese restaurant! That’s one of the things I love about this time of year, learning about everyone’s traditions! 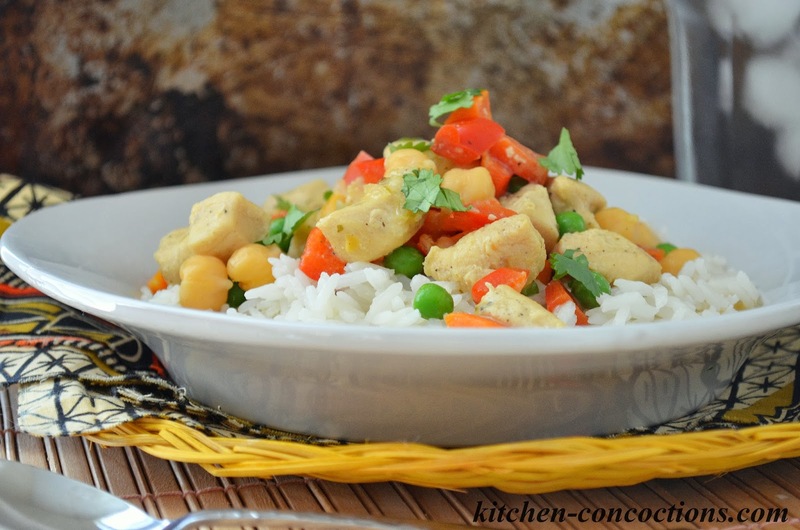 This Easy Coconut Curry Chicken Stew with Coconut Rice may not be YOUR traditional holiday meal, but it could be! You see, when I was a child, we always had soup, chili or casserole (something easy, in preparation for the big day) for dinner on Christmas eve. Then we would load up in the mini van express, go look at Christmas lights and then come home unwrap one gift (always matching PJ’s) and eating cookies and drinking hot cocoa to wind down in preparation for Santa. If this is a similar tradition in your own house, then a big bowl, of warm and tasty (slightly exotic) chicken stew is just what you need! 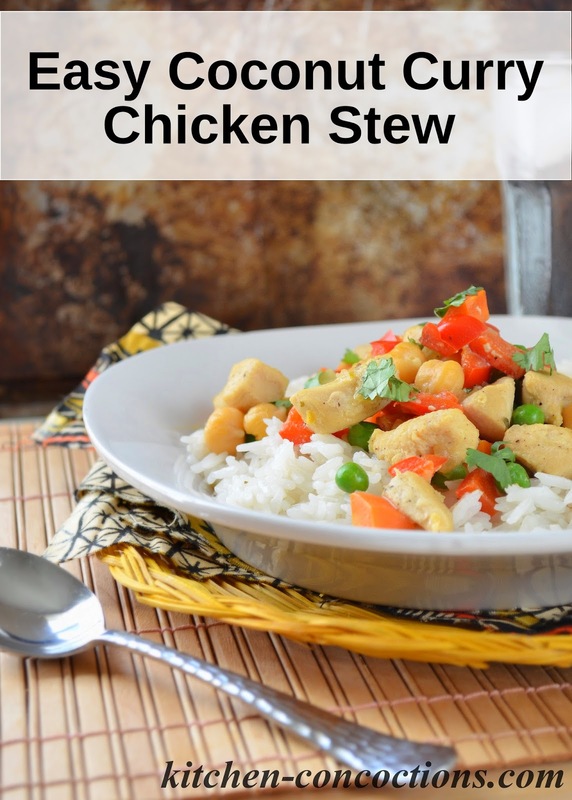 And even if you don’t eat this stew on for the Christmas holiday, it is a super quick, 30-minute meal that is perfect for a cold, busy night in the days leading up to the big day! In a large pot, heat oil over medium-high heat. Season chicken pieces with salt and pepper. Add chicken to hot oil and cook for 3-4 minutes, stirring occasionally. Add the onions, red bell pepper and carrots. Cook for an additional 2-3 minutes, until the vegetables are slightly soft. Stir in the chickpeas, green peas, chicken broth, coconut milk and Campbell’s Thai Green Curry Skillet Sauce. Bring the stew to a simmer and cook for 10-15 minutes. Stir in the lemon juice and cilantro. Add additional salt and pepper, if needed, to taste. 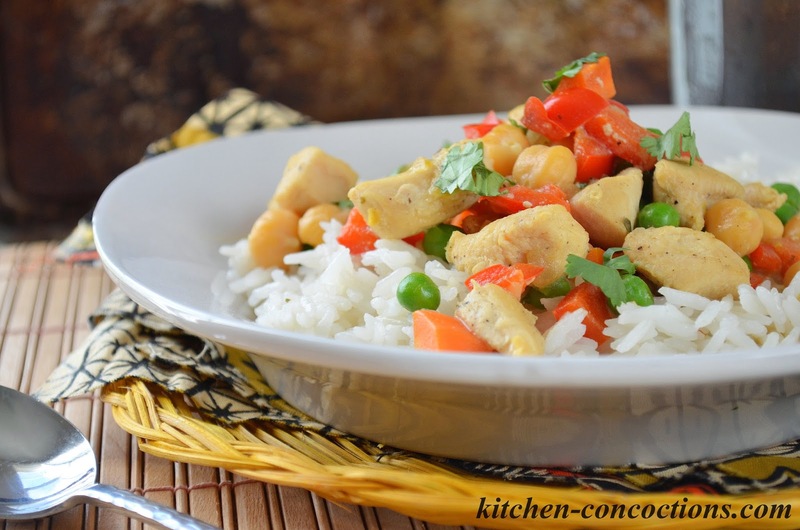 Serve stew over a bed of hot cooked coconut rice and garnish with more cilantro, if desired. Combine all ingredients in a 2-quart saucepan, and stir well to combine. Place pan over high heat and bring to a boil, stirring occasionally to prevent the rice from sticking. Once it reaches a boil, immediately reduce heat to low and cover pan. Cook for 14 minutes. Remove the pan from heat and allow the rice to steam, covered and undisturbed for 5 minutes; gently fluff with fork right before serving.